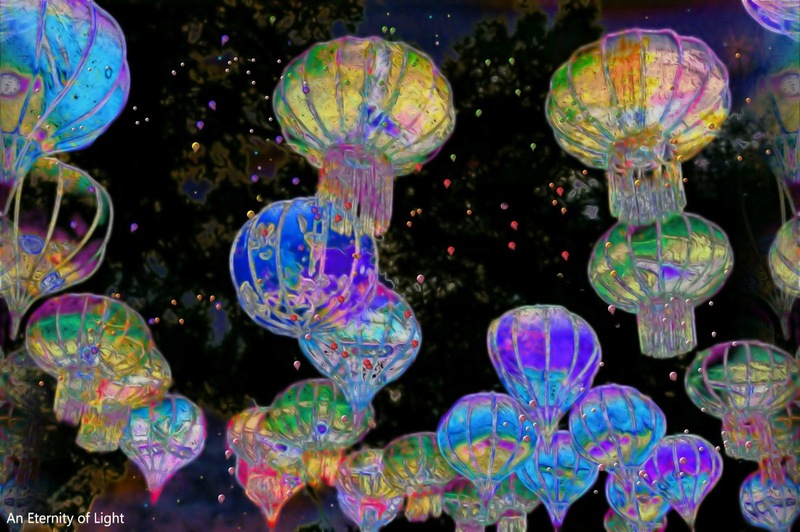 These Chinese lanterns seen at the China Lights Exhibition in City Park New Orleans reminded me so much of giant cosmic jelly fish, that I had to create a piece around it. Lanterns have always been a love of mine. On the island of my birth Martha's Vineyard there is a circular area filled with tiny brightly painted cottages. In the center is a giant open air tabernacle where Methodist preachers used to give sermons. Once a year all of the surrounding cottages put out thousands of Chinese lanterns and in the circle and tabernacle fill with people. Then at the appointed hour, all the lights in the area go off, street lights, emergency lights, etc. And with the flip of a switch a thousand lanterns suddenly come to light. It is truly a magical moment. This piece is created in remembrance to that moment. This is part of a series of art based on the China Lights.